Virtualized desktop infrastructure or VDI brings many tremendous benefits to organizations looking to modernize end user computing. However, without the right tools to manage VDI environments, there can be challenges with doing this efficiently and effectively. This can be even more of a challenge when managing thin client devices when thin clients are spread across multiple sites. Praim provides many really nice tools that allow organizations to meet the challenges of managing virtual desktop environments and even those environments that span multiple physical sites. Praim recently introduced the Praim Gateway appliance that allows effectively managing thin clients that are spread across multiple remote office locations, sometimes referred to as branch offices. In this post, we will take a closer look at how to Manage Thin Clients and PCs Across Remote Sites with Praim Gateway and see the benefits it brings to the thin client environment spanning multiple sites. At the center of Praim architecture is Praim ThinMan Server. ThinMan Server is the component of the Praim infrastructure that allows centrally managing thin client devices including performing updates, providing support, implementing policies, and other functionality. However, in many corporate environments with multiple branch offices, the ThinMan Server will be housed at the central datacenter location. Having all communication traverse each WAN link between the branch office and the central datacenter is generally not the best use of available bandwidth. Additionally, management of remote thin client devices by traditional means can create network complexities. 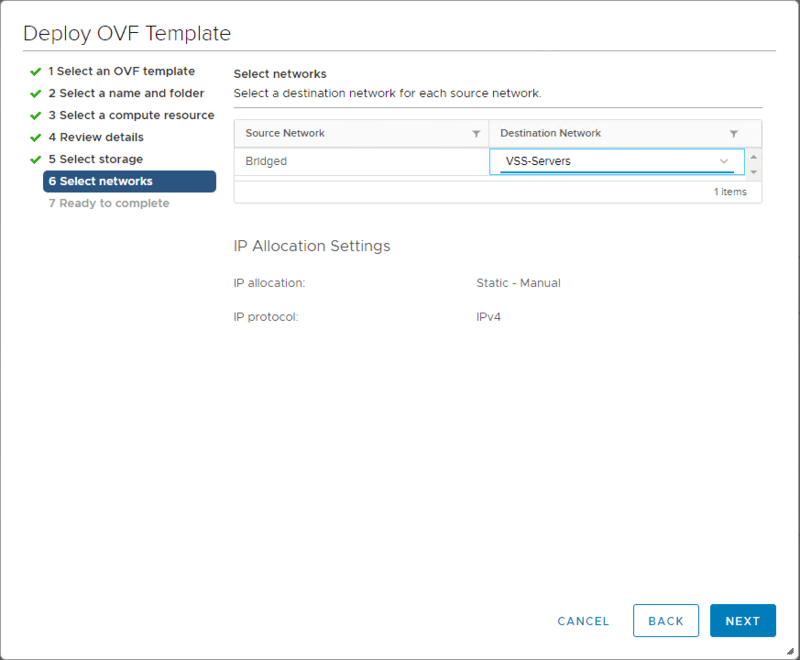 Generally speaking, most environments will have different network subnets at each remote office location with traffic carried between the locations via VPN connections, MPLS, or some other network technology. Speaking to some of the network complexity and connectivity challenges faced by organizations today who may be managing thin client devices across remote branch offices, ThinMan Gateway allows accessing branch offices without VPN. 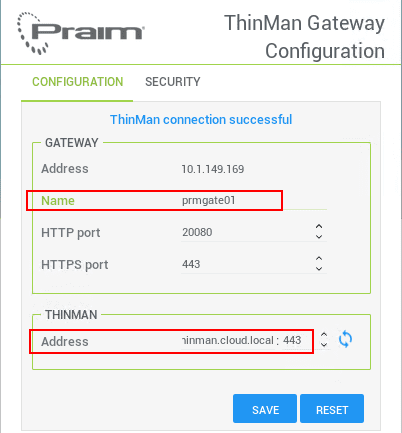 Once the ThinMan Gateway is installed in the remote branch office, administrators can access remote devices and manage these effectively without any other special connectivity requirements. This ensures a completely secure and centrally managed environment. The following graphic shows the Praim architecture including the Praim Gateway appliance in the mix. As you can see the ThinMan Gateway appliance sits on the border of the remote branch location and interfaces with the ThinMan Server over the Internet without VPN, etc. 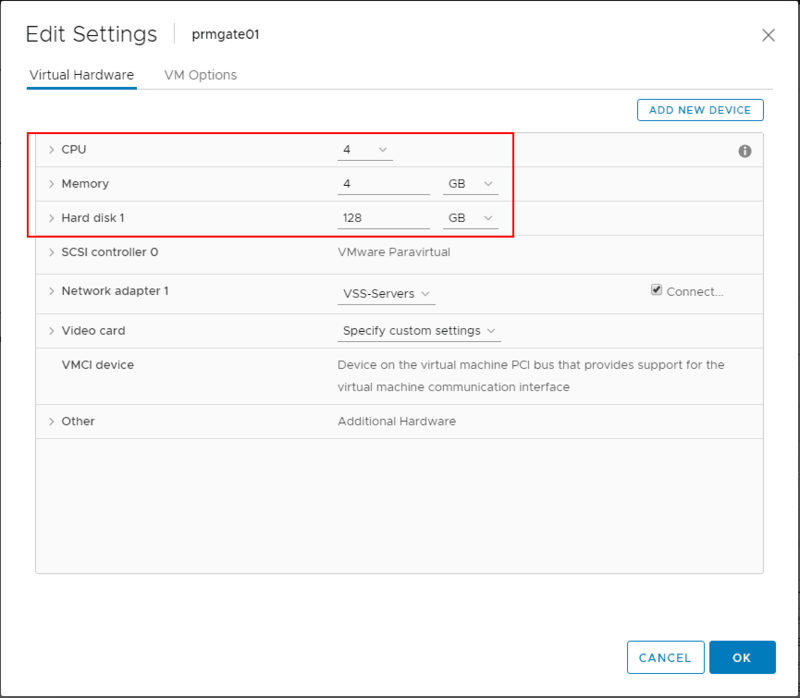 In the following walk through we are using the virtual appliance in a VMware vSphere environment. Praim provides virtual appliances compatible with the respective hypervisor platform. 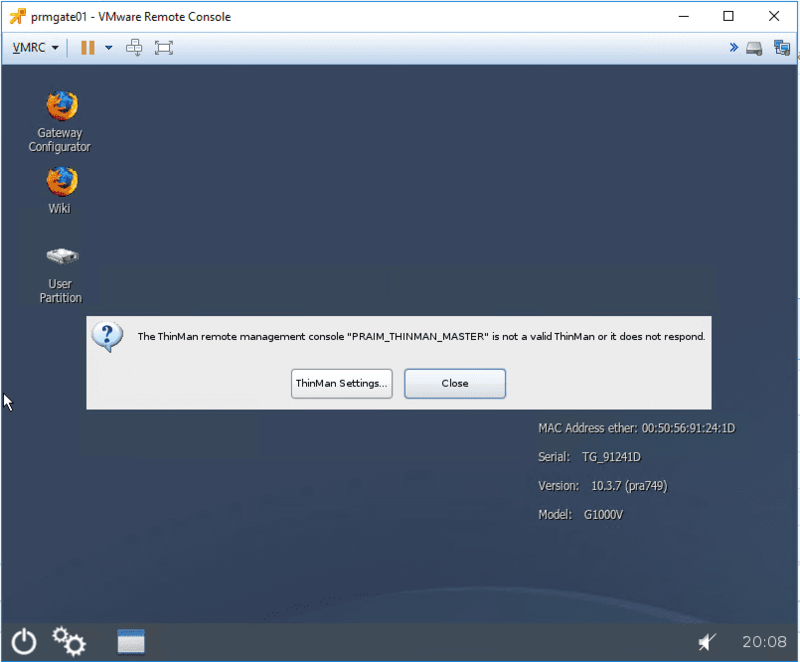 For VMware vSphere, there is an OVA appliance provided by Praim for deployment which makes getting it up and running extremely easy. 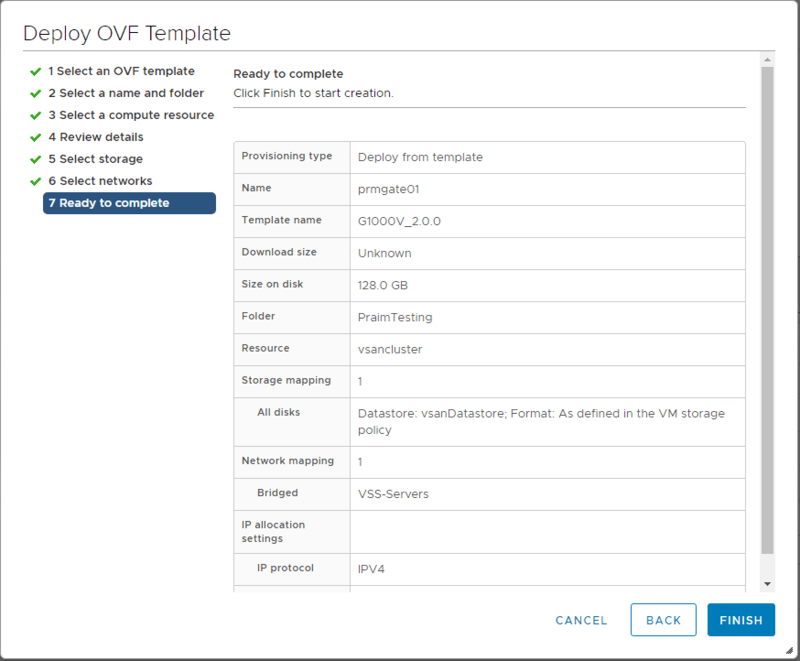 Let’s take a look at the deployment of the OVA appliance. In the first step, you will have already downloaded the appliance from Praim. 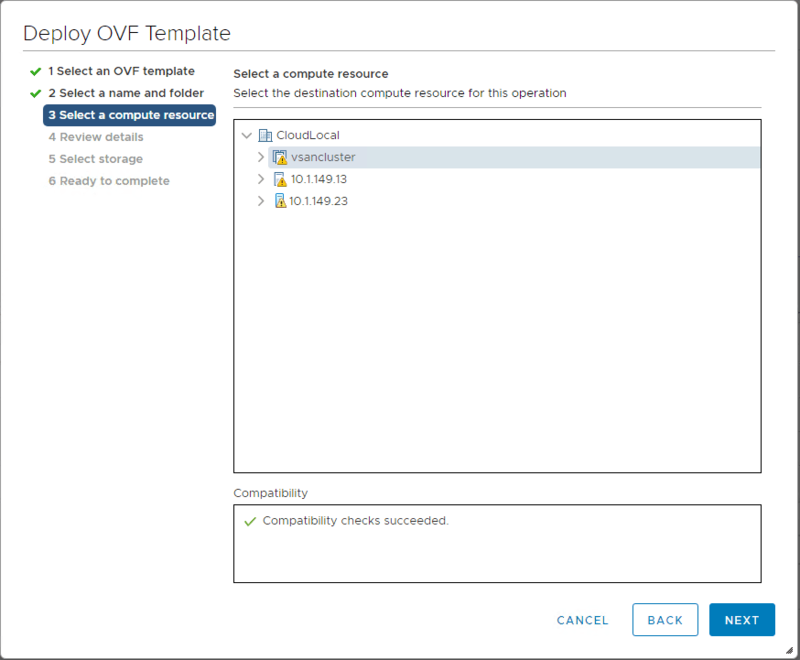 Select the OVA appliance in the Deploy OVF Template wizard. 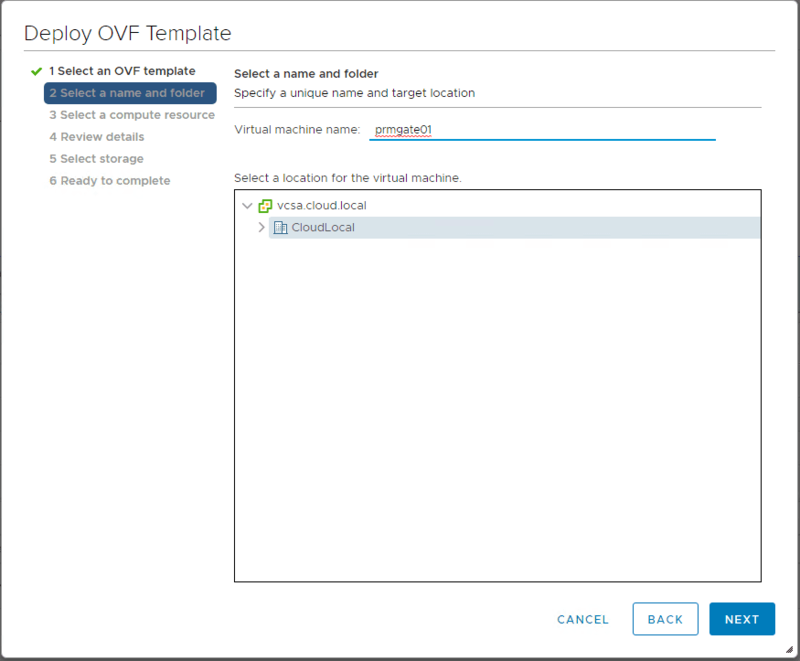 Next, name the ThinMan Server appliance and select the location to create the new virtual machine in vSphere. Up next, select the compute resource for the new ThinMan Gateway appliance. The Step 4 of the process has you review the details of the template deployment. Next up, select the datastore you want to use to house the ThinMan Gateway appliance. Select the vSphere network portgroup the ThinMan Gateway appliance will use to connect to the network. Finally, you are ready to complete the deployment process. Review the details to ensure no changes need to be made and click Finish. The below screenshot displays the resources allocated by default to the Thinman Gateway appliance. As you can see, the footprint is relatively small, outside of 4 vCPUs. 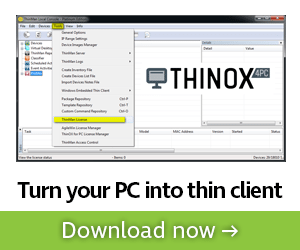 When you boot the ThinMan Gateway appliance, you will see the ThinOX environment boot. A dialog box will appear to populate Thinman Settings. Under the Connection tab, populate the ThinMan Address (IP/HostName). 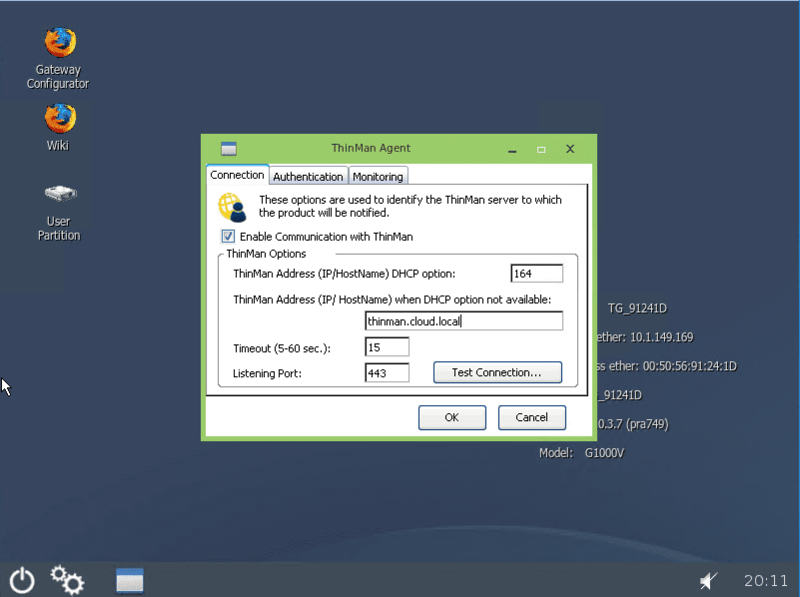 After configuring the ThinMan Server address, click the Test Connection to ensure connectivity to the ThinMan Server. Launching the Gateway Configurator, you are able to configure ThinMan Gateway configuration on the appliance. This is a shortcut found on the desktop of the Thinman Gateway appliance. In this look at how to Manage Thin Clients and PCs across remote sites with Praim Gateway we have seen how remote management of thin client devices across physical branch office locations can present challenges. Praim provides an intelligent solution to be able to centrally manage thin client devices across VDI technologies and do this across multiple locations. 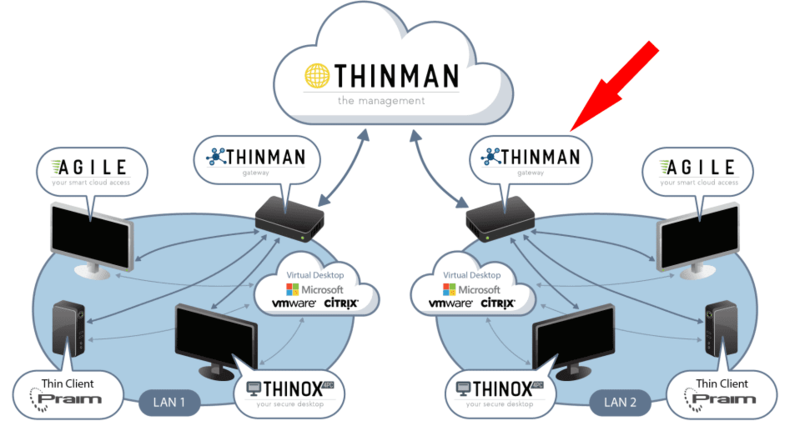 The recently released ThinMan Gateway appliance provides a powerful way to remotely manage these thin client devices, even without VPN connectivity or direct connections to each location. Using the ThinMan Gateway, administrators can manage Wake On LAN capabilities, updates, config changes, etc. It also allows businesses to make extremely efficient use of available bandwidth by synchronizing updates from ThinMan Server to the ThinMan Gateway appliance so that thin client devices pull these from the ThinMan Gateway and not across the WAN from the ThinMan Server. This is a great addition to the Praim lineup. 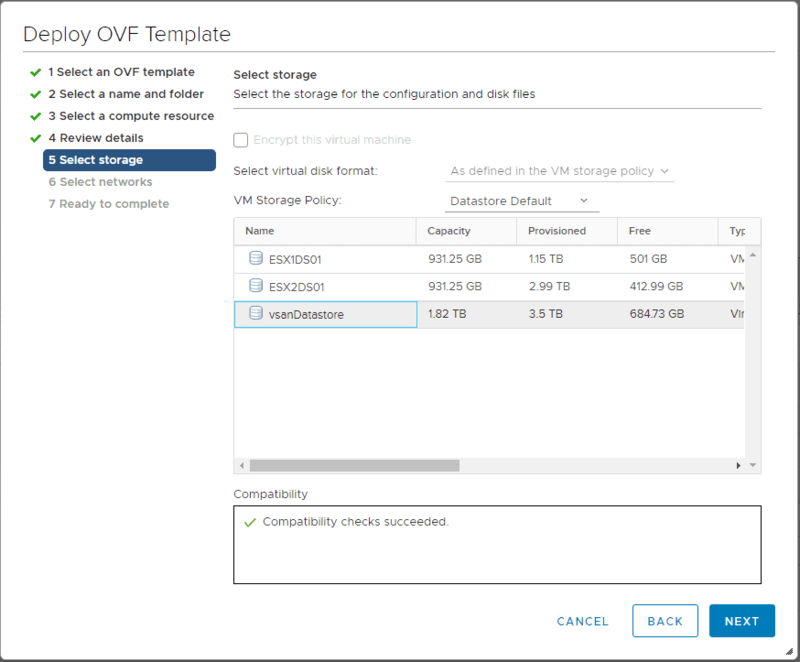 They have made it easy by providing three versions of deployment, including the very easy OVA appliance for vSphere environments. Managing remote thin client devices need not be difficult with the Praim solution powering the environment. It allows organizations to operate intelligently, quickly, and efficiently, across any IT landscape and ensures any supported VDI solution is able to deliver both in terms of end users and administration. 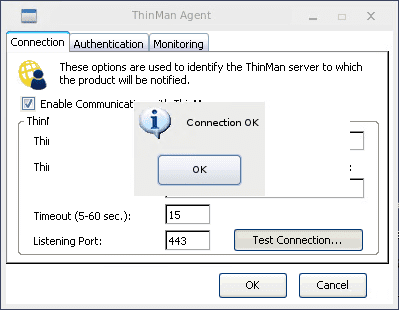 Free trial of ThinMan and ThinMan Gateway can be download here.